This past July, The Rhema Foundation Canada travelled from Toronto to Kampala, Uganda, to embark on a medical humanitarian mission to deliver medical and dental support, along with extensive health education, in the most vulnerable areas of the capital city. This edition of our ongoing Uganda blog series explores what happened when the Foundation first touched down in Kampala. Despite the long and winding route, the journey from Toronto to Uganda went off without a hitch. Indeed, right from the outset of the trip, the Foundation was greeted with warmth and generosity from Air Canada and Brussels Airlines. Both airlines helped to make the journey smooth and seamless by waiving the baggage fees for 14 boxes – more than 250 pounds – of medical supplies and equipment received from sponsors and partners. Not only that, but the team was also treated to excellent service by representatives from both airlines throughout the journey. After a long, but pleasant journey across the Atlantic, the team arrived in the bustling capital city of Kampala. With nearly two million people living within its boarders, the city is bursting with energy and vibrancy. However, the rapidly growing population has also meant increased pressure on social services such as healthcare, which was immediately apparent to the team from the moment of arrival. This was evident not only in terms of the need for greater medical infrastructure, but also the pressing need for medicine, medical supplies, technology, and even healthcare professionals. To dive deeper into the pressure on Kampala’s strained healthcare system, the team set out to meet with the KCCA Director and Health Centre Leadership. It was here that the team had the pleasure of speaking with KCC Executive Director Dr. Jennifer Musisi, who officially accepted a donation of medical supplies provided by the Foundation’s partner organizations HPIC, MMI Canada, and Merck Canada. During the visit, Dr. Musisi helped to explain the urgent need to advance and reform medical treatments and practices in Kampala, as well as the need to address the lack of awareness around health and hygiene. To get a better understand of Dr. Musisi’s concerns, the team then moved on to visit the Medical Mission at Kisenyi Health Centre. The Kisenyi Health Centre is located in a busy area of downtown Kampala, and it is predominantly inhabited by Somali refugees. The staff and practitioners at the Health Centre see up to 250 outpatients on a daily basis, many of whom suffer from easily preventable diseases. The Health Centre is also known for its large, CDC-funded weekly HIV/AIDS clinic, which services about 500 patients per day, and more than 200,000 patients on an annual basis. These staggering numbers speak to the ongoing HIV/AIDS crisis in the country, and the pressing need for ongoing support and care. 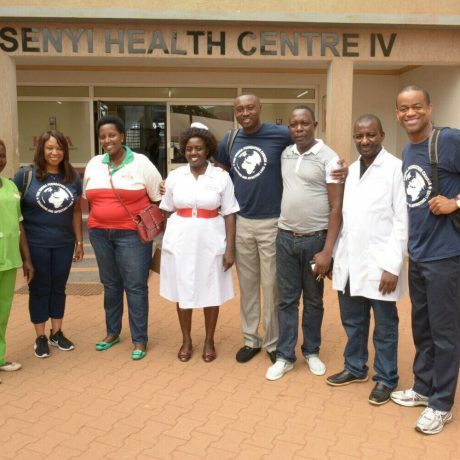 The team was also able to visit the Health Centre’s maternity ward, which delivers 350-500 babies per month. The staggering number of new mothers means that women are only able to stay in the hospital for a mere six hours after giving birth, and only 24 hours after a C-section. Needless to say, the first few days in Kampala were both eye opening and emotional for many of members of the team. However, these early moments also helped to instill a commitment to learning more about the country’s healthcare system, and about how long-term improvement can be made. To find out what happened in the following days, be sure to check back for the next chapter in our ongoing blog series!